...with a glint of metal... After all the selecting, culling and final editing and the twenty 12" x 12" squares in 7 different colors I painted on the master bedroom walls we have finally (maybe) come up with a paint palette* that pleases both The Guy and picky me. Benjamin Moore Bittersweet Chocolate brownish black. Tasty on the trim to match the dark vanities. By the way designers and decorators, Benjamin Moore has just launched a couple of exciting projects- new showrooms in New York and Chicago that have variable lighting to mimic those pesky north and east facing windows I'm currently dealing with and huge color blocks so you can truly imagine your finished design. 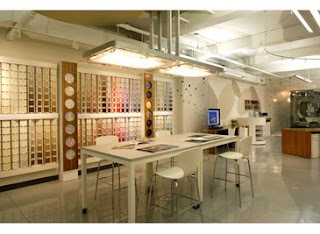 The NYC showroom is painted in Cloud White, a shade I've used very successfully at The Cool House that provides a neutral background to the color chips. Additionally, the "Designer's Colors" Virtual Fan Deck, a design-tool launched a couple of years ago with Kravet fabrics and furnishings is now available online making complimentary color choice a snap. 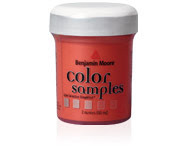 Benjamin Moore has also added an e-commerce section to the website so you can buy all the supplies BM offers, plus the sample pots in 600 colors, without stepping away from your computer. Shipping is free on orders over $75 and for 4 or more Color Sample pots. My local paint store is only offering pint samples these days - great for touch-ups or small areas, not so economical if you want to try out 3 or 4 colors on the wall. If you have any painting dilemmas there is a problem solving section too: Learn How that incorporates tips on faux-painting techniques and a calculator so you know exactly how many gallons of paint to order. *For those keeping count - during the master bedroom project I have spent countless hours using BM's Personal Color Viewer, made innumerable trips to the paint store, bought 5 Color Sample pots, three pint size pots and 50 chips - all to find that what works best is a color scheme I used here, here and here. Ironic, no? I've been dying to paint an entire room that bittersweet chocolate brown-- great choices! and may I add that it all goes so swell with that 'lamp' inspired fabric?